While Microsoft and Yahoo pounded out a new long awaited partnership, a small company has firmly placed it’s hat into the arena as a Real-time search engine, Twitter.com. Twitter has long been seen as a site for uber geeks, and that thing people do for fun, but today Biz Stone one of the founders of Twitter announced on the Official Twitter blog about the new home page redesign. It looks like they have made a change for the better or maybe the worst (more about that later). The new design shows a focus on topics that are hot by the minute, day, and month. This is showing up as a fire storm on the internet it’s obvious that twitter is really trying to make money by positioning themselves in a better way to grow and create revenue. We all know how many companies have failed at trying to change the original concept of having fun while being different from the rest of the pack. 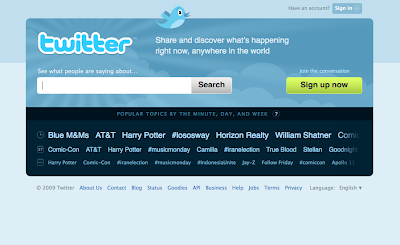 Twitter will remain different from Bing.com and Yahoo.com which are both horrible in there own little ways. A head of twitter I see a lot of changes to the culture and pure awesomeness of the site I have come to know and love. You see twitter while a darling in the social world is burning through cash like Netscape was during the Internet Explorer invasion. The only way for twitter to survive and stay a float is to do something that gives them more appeal and makes us all look at them like the kid that got beat up on the playground. You feel sorry for the poor guy, but those who were his friends from the beginning will remain loyal and now tell more friends just how awesome he really is. The internet has long been buzzing about what twitter can do to start making money, I think this is one of the items on the radar along with paid accounts, which hopefully will give you more capability. I think the problem with twitter coming up with paid capabilities is the fact that most of what they think up will have already been made by a third party app using the Open twitter API. While it has been a challenge trying to explain what twitter is to a lot of my friends who are not twitter users, this looks like at least I can tell them use twitter when you want to search a topic that is right now Real-time. If a huge news story hits the wire, it’s almost a given it was first reported in 140 characters on twitter. The appeal to a lot of people is the always on and current topics that seem to find it’s way into twitter. Only time will tell if this “Search Engine direction” is a good move or not, we do know this twitter is here to stay and I’m loving every minute of my 140 characters. Good story now I understand.